By cooperating with wineries and producers we organize courses / tasting events at our wine shop and different restaurants with menu accompanied by wines / beers previously chosen. Creation of customized wine list for restaurants and wine bars. Home Delivery service in San Giorgio del Sannio (BN) and nearby villages. Shipments by courier in Italy and abroad at your request. 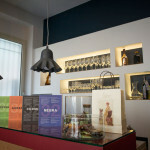 In our online shop you can find different types of packages which combine the best Italian wines and food.